When COP21 in Paris is over, the real work begins. 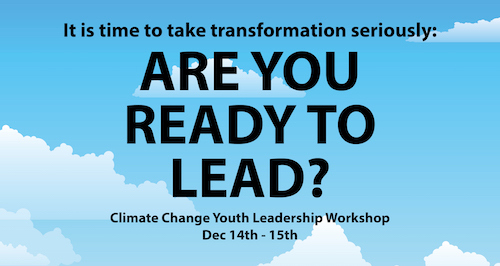 In collaboration with the Voices of the Future Project at University of Oslo, cCHANGE is offering a two-day leadership workshop to young people who are motivated to lead transformations to sustainability. 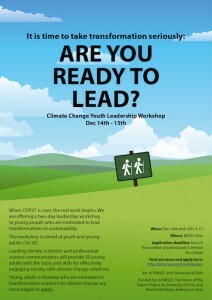 The Workshop on Climate Change Youth Leadership will provide young adults with tools and skills for effectively communicating and engaging society with climate change solutions. Getting together at MESH in Oslo on December 14th and 15th, we will use the momentum from COP21 to increase civic participation of youth in climate change solutions. 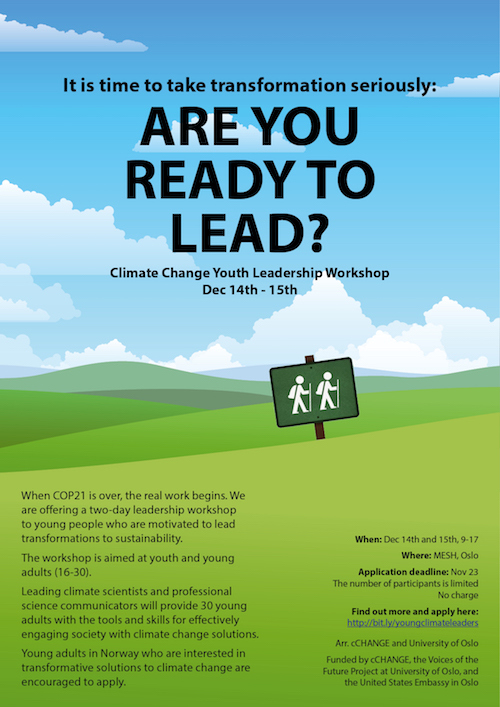 The workshop aims at building the skills of youth to be more effective in engaging with and influencing change, as well as activating the agency of youth to become leaders for positive change. It will help develop a community of youth working to generate transformations to sustainability. We are pleased to collaborate with professional science communicator Michelle Kovacevic, as well as science and environmental educator Sarah Dickson-Hoyle and researcher Gabrielle Schittecatte. The three will lead a delegation of 50 youth at the UN negotiations in Paris just before they arrive to facilitate the workshop in Oslo. Karen O´Brien will provide the framing for the workshop by giving an opening lecture on the status of climate change research and insights on transformations to sustainability. Young adults in Norway who are interested in transformative solutions to climate change are encouraged to apply. Application deadline has been extended to 12:00 at Nov 26, 2015. The number of participants is limited to 30. No charge. The Student Parliament at UiO “Lecturer of the Year 2015” prize awarded to Karen O´Brien sparked the idea for and provided the start-up funds for this workshop. In addition the workshop is funded by cCHANGE, the Voices of the Future Project at the University of Oslo, and the The Embassy of the United States in Oslo. If you have any questions, please contact Linda Sygna, at linda.sygna@nullcchange.no.